A number of utility-run energy efficiency programs for small businesses restrict eligibility not only by monthly energy consumption but also by peak demand. To understand the difference between the two, you have to start with the difference between kW, which measures the power being produced or consumed at any given instant of time, and kWh, which expresses a total amount of power produced or consumed over time. For example, one 100-watt light bulb burning for 10 hours consumes 1,000 watt-hours or 1 kWh. But at any given time, it requires or “demands” 100 watts or 0.1 kW from the utility. Compare this to ten 100-watt bulbs burning for one hour. At the end of the day, they will also have consumed 1000 watt-hours or 1 kWh, but at any given time, they require or “demand” 1000 watts or 1 kW from the utility. So the utility has to be ready to provide that 1kW of energy at any moment during the month. In other words, two facilities could consume the same number of kWh by the end of the month, but have different “peak demands.” And this is why commercial and industrial customers are often billed separately for their hourly energy consumption patterns and their peak energy demand. 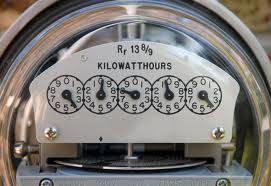 Utilities often use a meter that records the power use during either a 15- or 30-minute time window. The average power used during that window is used to calculate demand. Since it’s usually higher during the day than at night, and higher during either the summer or winter depending on location, the metering system tracks the highest usage anytime during the month under the appropriate time windows. This entry was posted in Uncategorized by GreenTech Energy Services. Bookmark the permalink.